Mike’s new favorite specialty is Angle Flying, he loves the speed and is attracted to the skill it takes for everyone to stay together! Like most skydivers, every jump is Mike’s favorite jump. But when pressed Mike admits his absolute favorite was a 22-way wingsuit in Puerto Rico. All 22 wing suiters stayed together, flew perfectly, and they all landed on the beach! We love beach jumps! When he’s not jumping, at his day job, or goofing around you can find him working on his carpentry. He uses his skills to make new furniture for his house! Mike’s weirdest skydiving moment is when he had 2 cutaways in the same weekend both with Cross Keys videographer Taylor Hines. He blames Taylor. We find this theory questionable. 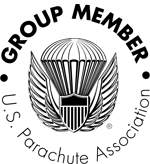 Like most instructors, Mike has a true passion for skydiving. A passion that his loves sharing with anyone who wants to learn. 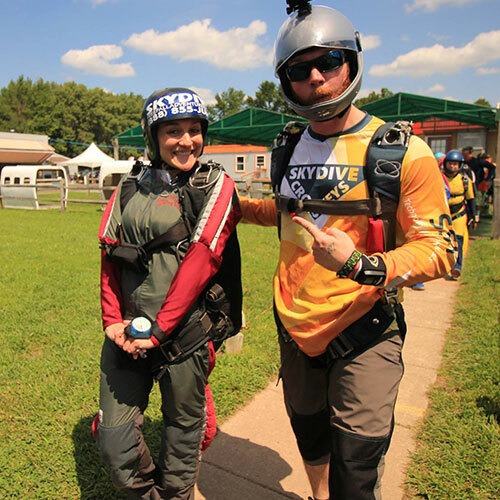 Mike’s favorite thing is seeing students progress and become more confident in their skydiving skills.